IronCarey, LLC, incorporated in 2007, was formed to provide Catalyst a hedging device against drastic swings in the cost of drilling and completion services that result from volatility in the energy markets. Drilling Services: IronCarey operates two Ingersoll Rand drilling rigs, each of which is capable of drilling approximately 100 Upper Devonian wells per year. IronCarey’s T-4 rig has the capacity to drill to a depth of approximately 2,500 feet and their RD-20 rig is capable of drilling to 5,000 feet. Stimulation Services: IronCarey’s fleet of stimulation equipment provides completion services, including down-hole fracturing of the reservoir rock. 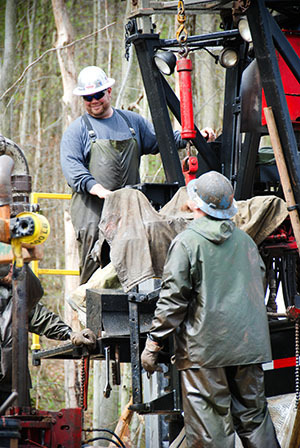 IronCarey’s inventory of stimulation equipment – including a pump truck, blender, iron truck, frac van and sand dumps – meet all of the demands of a shallow well fracturing operation in northwestern Pennsylvania. Completion Services: IronCarey operates three completion rigs to perform servicing operations, primarily those associated with down-hole fracturing operations. The rigs also support well servicing work and reworks for producing wells, and plugging operations for wells that can no longer produce economically.